It’s said that great things come in small packages, and that’s certainly the case for young entrepreneur Alina Morse and her healthy, delicious invention, Zollipops. 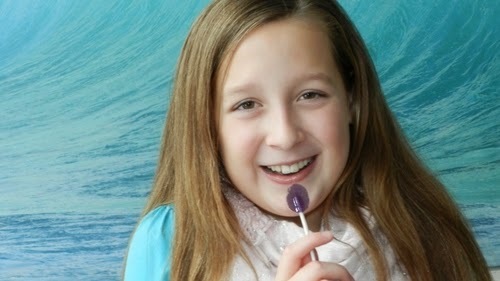 This 9-year old entrepreneur came up with the idea for a lollipop created from healthy ingredients that was just as good for you as it was to eat. I had the opportunity to speak with Alina to find out more about Zollipops and how she got started creating this delicious sweet treat you’re as likely to see on the shelves of Whole Food as at your dentist. What inspired you to come up with Zollipops? I wanted to make a difference and help people and make lives easier for guardians, and mostly moms. I got the idea when I went to the bank one day with my dad. The teller asked me if I wanted a sucker. My dad always told me that I should not eat candy, because sugar is terrible for your teeth. So on the car ride home I asked my dad if we could make a healthy sucker that was good for your teeth. I kept asking him, and finally we made the first batch. How did you create the first one? We did a lot of research to see what our main clean teeth ingredients were. We went to stores. We asked dentists and hygienists. We checked online. Then we made our ingredient list and found the perfect plant to make our Zollipops. It took many trials to get the ones we have today. When did you know you had a great product? I gave one to my little sister Lola, who is very picky about what she eats, and she thought it was great! She knows great suckers. Then Lola called them Zollipops, which was a great name that fit for a great product. We loved how the flavors fit together. When I shared with other friends and they loved them too, we knew we had a great product. How did it go from a project to a business? I focused on it with my dad as our top priority. We designed packaging and presented it to a retailer, and the retailer really liked them. How did you get the initial meeting with the Whole Food buyers to get Zollipops in stores? I worked on a presentation with my dad and submitted it to Whole Foods Markets buyers regionally and nationally with samples. We also got the product approved by the Whole Foods Whole Body quality. How have your parents been involved in the Zollipops business? My parents are very encouraging, and willing to help. They volunteer suggestions on flavors, colors and packaging. My dad is my consultant. I am the idea person. I ask him questions, and he helps me find answers. My mom helps me manage my time and also gives me suggestions about marketing to moms. How do you balance school and business at 9 years old? By splitting my time after school, one third for homework, one third for business updates or projects and one third for organizing and playing with my sister. What would be your advice for other young entrepreneurs who want to create? You can accomplish big things, and don’t let anyone tell you differently. Follow your dreams. If you put your mind to it, you can accomplish anything. Even if adults don’t think kids can make big things happen, you can, just believe in yourself.